Users of scale-out solution IBM Spectrum Scale are constantly looking to improve their underlying storage to meet the challenges associated with burgeoning analytics workloads. In light of this, apps utilizing Spectrum Scale benefit significantly from next-generation storage media like NVMe SSDs in the NSD servers that connect directly to the server’s PCIe bus. This technical white paper describes the features and benefits of Excelero’s NVMesh—a software-defined Server SAN supporting shared, scale-out, NVMe block-storage— for Spectrum Scale. 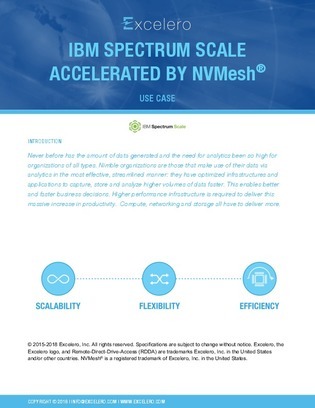 Read for the two reference architectures of popular NVMesh-Spectrum Scale configurations included.